It is the day on which the deen was perfected and Allah's Favour was completed. In Al-Saheehayn it was reported from 'Umar ibn al-Khattaab (may Allaah be pleased with him) that a Jewish man said to him, 'O Ameer al-Mu'mineen, there is a verse in your Book which you recite. If [that] had come to us Jews, we would have taken that day as an Eid (festival).' Umar said, 'Which verse is this?' He said: 'This day I have perfected your religion for you, completed My favour upon you, and have chosen for you Islam as your religion.' [Qu'ran, al-Maa'idah 5:3 interpretation of the meaning]. 'By the witnessing day [Friday] and by the witnessed day [the Day of Arafaah].' [Qur'an, al-Burooj 85:3]. It was reported from Abu Hurayrah (may Allaah be pleased with him) that the Prophet (peace and blessings of Allah be upon him) said: 'The promised day is the Day of Resurrection, the witnessed day is the Day of Arafah, and the witnessing day is Friday.' Narrated by al-Tirmidhi and classed as saheeh by al-Albaani. 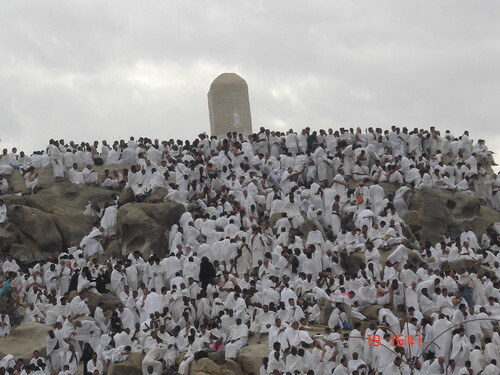 My day on Arafat was spent on this "Mountain of Mercy". I'm the one in grey. Fasting on this day is an expiation for two years. SubhanAllah! After reading this prophetic saying - Hadith, who wouldn't fast on the Day of Arafat? Brought to you by FOSIS Ireland. Don't forget to make extra du`a. I have just started my fast . . . off to do Salah . . . oh and I think you meant to say non-Hajjis are encouraged to fast, not non-Muslims, right? Excellent post dear. -_- Yes. Allahu akbar. They can fast too. Assalamalaikum Zaufishan! I have a question! Can we just fast on the day of Arafaah or we need to also fast a day before that? coz I have heard people say that jews fast for only 1 day, so we need to fast 2 days including the day of Arafaah! Please reply with reference dear! Happy late eid to you, may Allah keep you righteous.